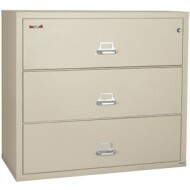 Of the Fire King 2 drawer lateral fireproof file cabinets, this is the widest. So even with only two (2) drawers, there is still plenty of storage for both legal and letter sized documents.It is both UL rated fire resistant and UL rated impact resistant. 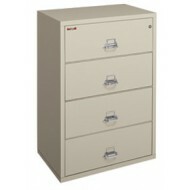 The 3-4422-C is an extra wide lateral fireproof file cabinet. You can store legal size documents side to side and letter size documents from to back - hardware inlcuded. 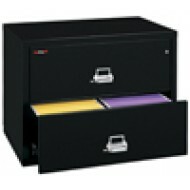 With one hour fire protection, the file cabinet also has tested UL rated impact resistant.